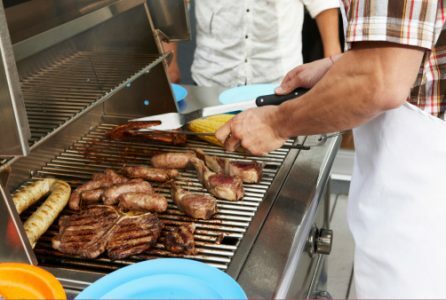 But grill masters beware – research has found that grilling with high-heat can increase your cancer risk. How does grilling meats over high temperature increase your risk of cancer? When beef, pork, fish or poultry are cooked using high-temperature methods, chemicals called heterocyclic amines (HCAs) and polycyclic aromatic hydrocarbons (PAHs) can form. These HCAs and PAHs are mutagenic, meaning they can cause changes in your DNA, in turn increasing your risk for developing cancer. The good news is there are simple ways to help reduce those risks. With just a little preparation and smart food choices, grilling can be fun, delicious and healthy. 🍔 Don’t grill your meat on direct heat. Turn the flame on part of the grill and put the meat on the other part that doesn’t have any flame. 🍔 Turn your meat frequently. If your meat happens to get exposed to direct flame be sure to turn it over frequently to reduce your exposure to HCAs. 🍔 Cut off the charcoal. If portions of your meat become charred during grilling, trim them before serving. That will also help reduce your exposure to these damaging chemicals.